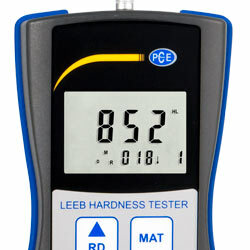 The Leeb hardness tester is made to measure the hardness of materials with the Leeb method. 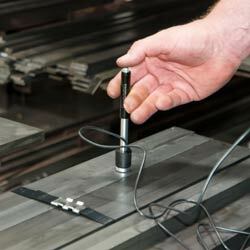 The rebound method is used by the hardness tester to get the measurement results. The rebound method includes one firing pin within the instrument which hits the metallic surface and bounces back. 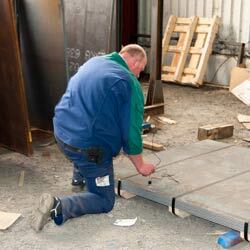 The strength of the rebound indicates the hardness of the material measured. The hardness tester is able to measure the hardness in six different hardness scales. Those scales are Rockwell, Vickers, Leeb, Brinell and Shore. The Rockwell hardness scale is in addition to that divided in Rockwell C and Rockwell D by the hardness tester. The memory of the hardness tester makes it easy to save your measured results on the hardness tester itself and read them out later. 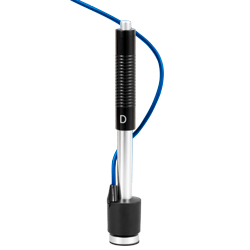 The hardness tester comes with an impact device type D which can be used for many different measurements. Furthermore the hardness tester has a data interface where the measured data can be transferred to a computer. Another benefit of the hardness tester is the ISO-calibration certificate, which is also include in the scope of delivery. That certificate allows precise traceability of the accuracy of the hardness tester. All these features make the hardness tester an important device for material testing at the incoming goods inspection. If there are any questions about this hardness tester, please call: UK customers +44(0) 23 809 870 30 / US customers +1-410-387-7703. Our technicians and engineers will gladly give you advice on this professional hardness meter and all other products in the field of measuring instruments, regulation and control, laboratory equipment and scales. 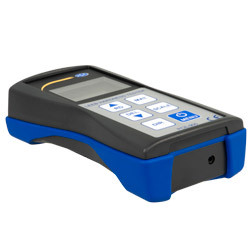 Since the device is battery-operated, the hardness tester PCE-900 is able to make non-stationary measurements. 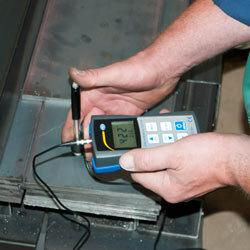 To perform measurements we have preset nine different materials within the settings of the hardness tester PCE-900. Our hardness tester PCE-900 can be used for different measurement purposes. There are six different hardness scales on the hardness tester PCE-900. 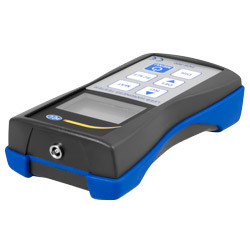 The hardness tester PCE-900 has a ergonomic design with makes it comfortable to work with. 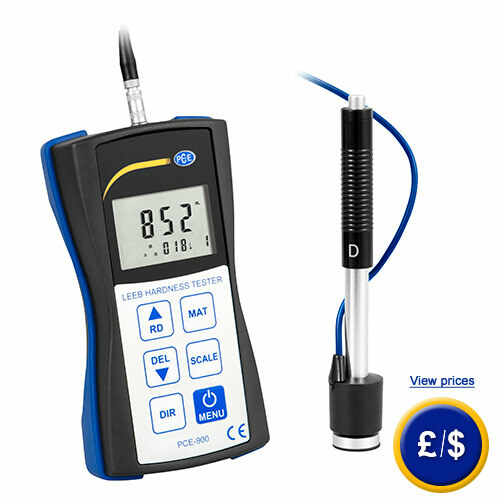 The hardness tester PCE-900 has a bright display due to the backlight-function. The hardness tester PCE-900 comes with an impact device type D.
The impact device of the hardness tester PCE-900 is connected to it on the top side.